Only the highest quality German Tools. 2/7/13 update! 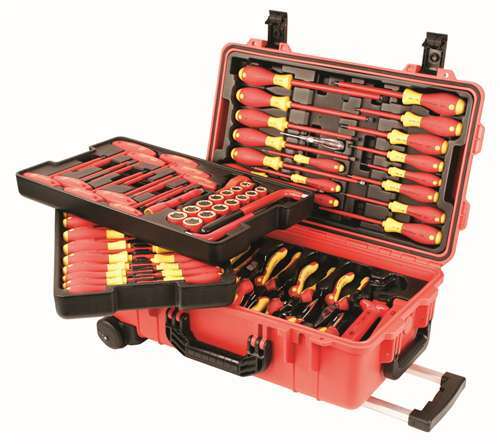 Unfortunately this item is no longer on sale but we do have a great deal on an open box version of the 80pcs master electricians tool set here. 8/6/12 Update! This item is on sale through Wiha which gives us a small discount we can pass on to you. The new sale price is $1214.55!!!! New from Wiha! 80 Pcs Master Electricians Rolling Tool Case (P/N Wiha 32800). It contains 80 high quality Electricians tools to meet the demand of any electrical job. All Wiha Insulated tools are rated at 1,000 volts and individually tested to 10,000 volts, so you can rest easy knowing you are safe on the job. Normal retail on this set is $1992.02 but you can buy it at KC Tool Co for only $1294.81! On Sale! Wiha 51 Piece Master Technicians Precision Screwdriver Set in Molded Tray. Deep Discounts on Felo and Wera! Introducing Sticker Packs! Free Over $100! Hammer Your Way Out Of Winter! Introducing Staff Pick Pliers Sets! Enter your email address to follow this blog and get the latest Wiha and KC Tool news via Email.